Latest Update: Thanks for those who have given feedback on the Guided Answer. As a result, the Guided Answer has now been updated with further information on how to extend Design Studio apps and Authorizations. As part of the S/4HANA Regional Implementation Group I’m privileged to work with and advise many of our SAP S/4HANA customers regarding making the most of the SAP S/4HANA User Experience. One of the questions we are asked over and over and over again, is how to extend standard SAP Fiori apps to add a few extra fields, set up defaults, or hide a couple of unwanted fields, or just to reorganize the screen a little. A lot depends on how the app was written. So now we have created a SAP Guided Answer to lead you through the extension process. On a typical SAP S/4HANA project, you will usually identify some gaps or custom business needs for the user experience. That’s just a normal part of adapting your S/4HANA solution to your business. At this design stage you will usually already have your SAP S/4HANA Fiori Launchpad, your Fiori apps, and your other classic apps working. However for many customers, partners, and consultants, the Fiori world – and especially the Fiori for S/4HANA world – is not as well known as earlier solutions such as SAPGUI or Web Dynpro ABAP. 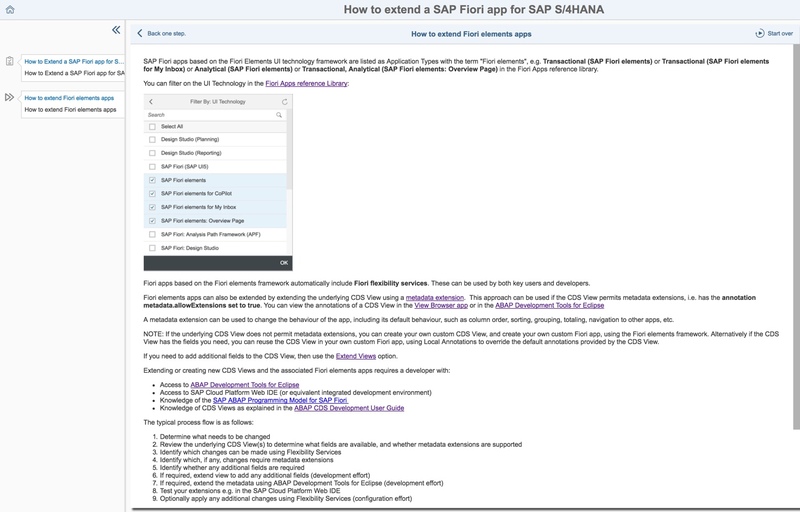 So your question is HOW do I extend the Fiori apps? 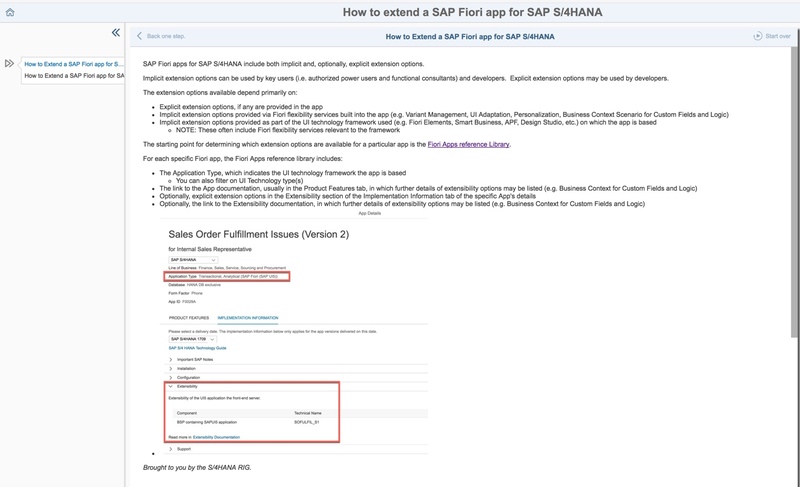 You can now use a SAP Guided Answer – How to extend a SAP Fiori app for SAP S/4HANA to lead you through this process. Just read the introduction and scroll down to choose which type of SAP Fiori app you need to extend. Ok well the first thing that will help you understand what’s possible when extending Fiori apps is that while the apps are all written using SAPUI5 ( SAP Development Toolkit for HTML5 ) different apps can be based on different UI technology frameworks. These frameworks are essentially composed of different smart templates & features that provide implicit extension options and flexibility services that you can use to adapt your Fiori app. While implicit extension options usually require developer tools and skills, Flexibility Services include features that can be used by authorized key users (such as power users, business process experts, and functional consultants on your project) and developers alike. Typically these Flexibility Services are executed directly in the Fiori interface, e.g. using options in the Me Area or using specific Fiori apps such as KPI Workspace (for adjusting Smart Business KPI thresholds, targets, timelines, currency) or Custom Fields and Logic (for adding fields and business logic to business context scenarios that impact the behaviour of multiple related apps). And of course the Fiori app could also be a freestyle app (i.e. written without a smart template) with explicit extension options. And of course some freestyle apps also have Flexibility Services built-in. So being able to identify what UI Technology framework has been used, what extension options it provides and how to approach extending that type of app means you can approach extending a Fiori app with confidence. Knowing what’s available for a specific Fiori app also helps you estimate effort – as flexibility services and implicit extension options are typically quicker to implement than explicit options. The process flow is particularly helpful for the many Fiori apps which provide multiple extension options, as it tells you in what sequence you should apply extensions. 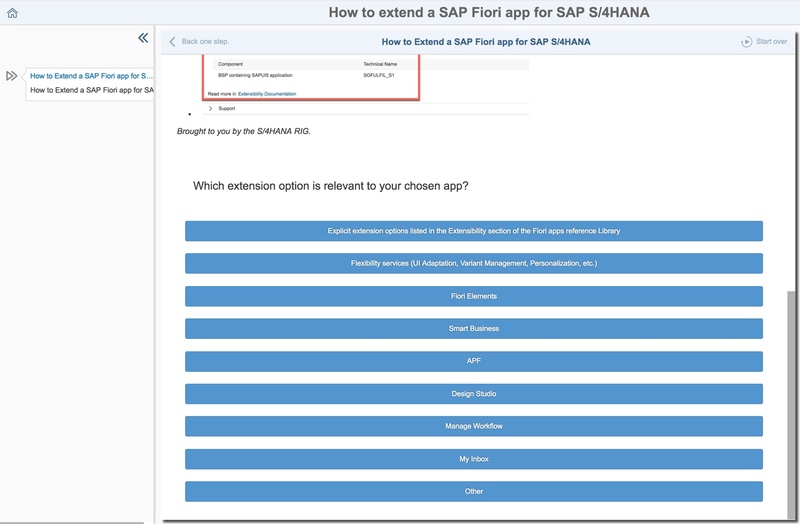 You will also find a special section just for Fiori app My Inbox – just because it’s time and again the most popular app with SAP S/4HANA customers and it has some extra configuration capabilities you can use for extensions. You can also give us feedback on the Guided Answer. If there’s anything that’s not clear, or where you would like to see more information, or if there’s any other topics you would like created as a Guided Answer, or you just want to give us some encouragement, please add that in the feedback or in the blog comments here. And you will find more Guided Answers in the Guided Answers Viewer. One particular extensibility scenario we require SAP to review is about “Extension for re-Usable Components / Library for FIORI Apps”. As the name implies, these components have standard functionalities that are required by most FIORI applications. In our specific instance, we have extended the component: “PLM_ATH_CRES1 (i.e. sap.se.mi.plm.lib.attachmentservice)” that is used by some of the standard FIORI Apps for attachment services; in conjunction with the backend ODATA service. The main goal for us was to provide additional functionalities that were not covered in the attachment services. Whilst our extension projects for both the backend service and front-end components were largely successful; we are currently challenged on how to seamlessly hook our extended “PLM_ATH_CRES1” to the standard FIORI APPs without having to extend those as well. We are aware of SAP position on this use case and your response on this issue here Reusable Component. We believe that this use case is very important and do hereby implore SAP to review its position on this and thus, avail us the opportunity to seamlessly hook the extended component to the FIORI Apps. Interesting… not supported as far as I know yet. The Attachment Service gets updated quite frequently with continuous improvements so it would be worth checking the roadmap to see if what you have added is being provided in standard and you may be able to return to standard at some point perhaps?